Make every event a great event with this life like critter on your cool Great Dane Bottle Stopper (Black Uncropped). Who could resist the charms of this cute little guy designed to fit perfectly atop any standard wine bottle. 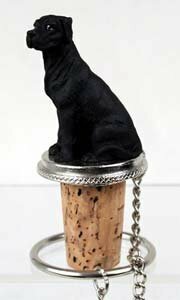 Measuring at 1 1/2 to 2 inches tall and made of the finest pewter based cork, Great Dane Bottle Stopper (Black Uncropped)s will impress one and all with their lifelike detail. This magnificent animal makes a memorable gift for any wine connoisseur. Your friends will be merry every time they lift a glass with the cute Great Dane Bottle Stopper (Black Uncropped). Made of Poly Resin and Hand Painted. Pewter Base with chain and Ring to keep it with the bottle. Approximately 1.5 - 2 inches.